Don’t know what to buy me for a gift? Pocket-sized Moleskine notebooks will do just fine, thanks. I have these little notebooks all over the place – in my handbag, in the car, on my bedside table and pretty much in every room of the house – I never know when I might have to jot something down. Despite living in the computer age, I still use a notebook and pencil for most of my writing – weird but true! But one modern gadget that I really love is my iPhone so imagine my joy on discovering Moleskine’s new iPhone and iPad covers. 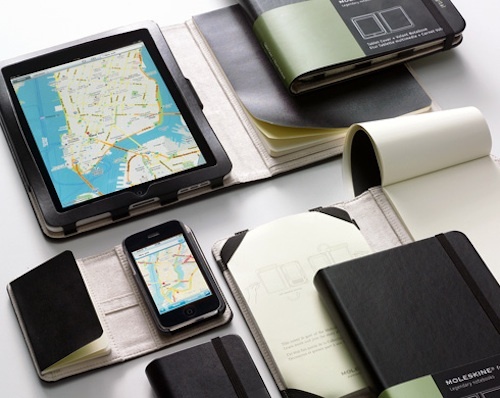 The story of the Moleskine brand is almost as charming as the products themselves. Created in Italy, the simple but recognizable Moleskine notebook cover has been re-invented for the iPhone and the iPad. Designed to make it easier to use paper, phone and internet simultaneously, the Smartphone Cover (compatible with iPhone 3G and 3GS) and the Tablet Cover (compatible with the iPad) feature a neat black cover, strong elastic band, blank notebook pages and suede lining to protect your device. Kids take note – the blank notebook pages are not for random scribbles, they are reserved for your parents’ most important notes and thoughts. Sign up for the pre-order of both the Smartphone and the Tablet covers at Amazon. No word on price at this stage. For more iPhone covers check our previous posts here.